As soon as I saw this cake over at The More Than Occasional Baker, replete with my guilty pleasure, Maltesers, it was only a matter of time before I was going to bake it. Luckily, my birthday provided the perfect excuse. After all the birthday festivities, ahem, back in July, it was time to go back to work – this means taking in birthday cake. If ever we get boxes of chocolates at work it is usually the Maltesers that disappear first. I thus reasoned, a Malteser cake would be a popular one for my work colleagues. As Ros didn’t actually have the recipe on her site, I googled it and found it over at BitterSweetSpicy. The recipe comes from Annie Rigg’s book Make, Bake & Celebrate – I obviously have a serious gap in my baking book collection! Having just read Alida’s post about using vinegar as well as eggs and baking powder, I thought I’d give this a try rather than using buttermilk which I didn’t have. Because I made a mistake in the amount of sugar I used to begin with, I upped all of the quantities slightly as well as making a few other adjustments. Creamed 175g unsalted butter with 150g sugar (half vanilla sugar, half dark brown) until very light and fluffy. Added a pinch of rock salt and creamed some more. Beat in 3 large duck eggs one by one. Sifted in 275g self-raising flour (half wholemeal, half white), 1/2 tsp bicarbonate of soda and 2 heaped tbsp of Horlicks. Stirred in 100ml water mixed with 80ml of milk and 1 tbsp cider vinegar until just combined. Divided mixture between two 21 cm cake moulds and baked at 180C for 30 minutes. Poured 200ml double cream into a bowl over warm water and whisked in 50g of Horlicks. Added 250g 37% milk chocolate (G&B) and left to melt. Removed from heat and stirred in 1 tbsp golden syrup and 75g unsalted butter. Left to cool and turn thick enough to ice. Slathered the mixture all one cake thickly and placed the other one on top. Covered the other cake and sides with the rest. Placed maltesers around the edge. What I realised as soon as I’d put the cakes together and it was all too late, was that I had forgotten to crush some maltesers and put them in between the layers. Well what a shame, I was really looking forward to that bit. However, this proved to be the most popular cake yet with my work colleagues and I have to say I could very easily have demolished a goodly proportion of it myself if I’d had the chance. I had to make do with a modest slice though, which means only one thing – I will have to make this again. I am submitting this to Jac’s Bookmarked Recipes over at Tinned Tomatoes. Wow wow! What a stunner of a cake. I love the really thick glossy icing too. She’s a real beauty. I too was thinking about making this cake after seeing Roz’s post. Perhaps you’ve started a challenge here! It looks so delicious, lucky work colleagues! Oh gosh, you are reminding me of my weakeness here..I love Maltesers and find them so addictive. I’ve used them once in a slice and it was ridiculously yummy…I bet it would be the same with this cake here. Lovely presentation too! Oh my…I would come and work with you just to have the opportunity to try that amazing cake!! looks delicious – can you please join my workplace – no one bakes cakes like that where I am and now I wish they did!!!!! Delicious – I’m not sure why Maltesers tend to go first, but, you’re right, they do. That is amazing. I need this cake. I have to make this cake. It is perfect Choclette. wow. it really looks superb. I am bookmarking this as it is just so good! I make Nigella’s malteser cake regularly, but this icing looks much nicer – will be making this cake very soon! 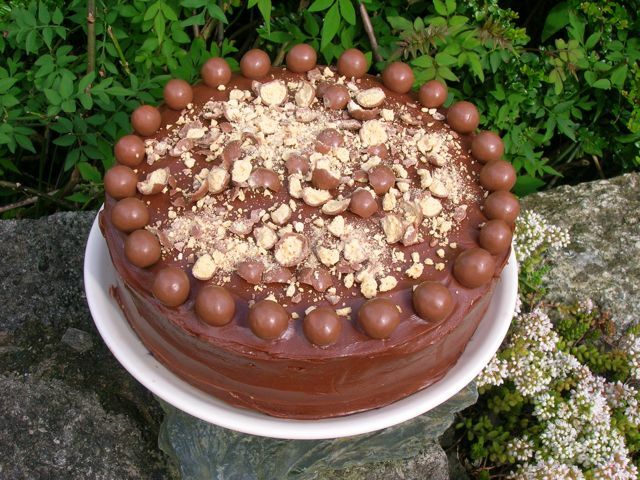 I need this cake in my life – maltesers are one of my favourite chocolates ever and I love Horlicks! Beautiful! Love malteasers. You’ll just have to make the cake again to put the crushed malteasers in it! I don’t think I’ve ever had a Malteser – I must be slow off the mark when the boxes of chocs come around – but I definitely want one now, preferably attached to this cake! Beautiful cake! I’m quite partial to a Malteser or ten, I’m sure I’d love this. I made Annie Rigg’s Easter cupcakes which look like a similar recipe (they contained Horlicks too) and they were divine so the thought of a big version covered in Maltesers…….oh my! I would love this as the Malteser’s are always my first choice from the Celebration box. I bet the hidden middle layer would be even better. You will enjoy making this one again, I bet! This would make happy my birthday boy! It looks delicious. I like the ideaof using Malters to decorate a chocolate cake (why did not I think of that before??). Thanks for all your lovely comments whilst I was away. I really enjoyed reading them, as always. That’s a beautiful chocolate cake! Visiting from Bookmarked Recipes on Tinned Tomatoes.